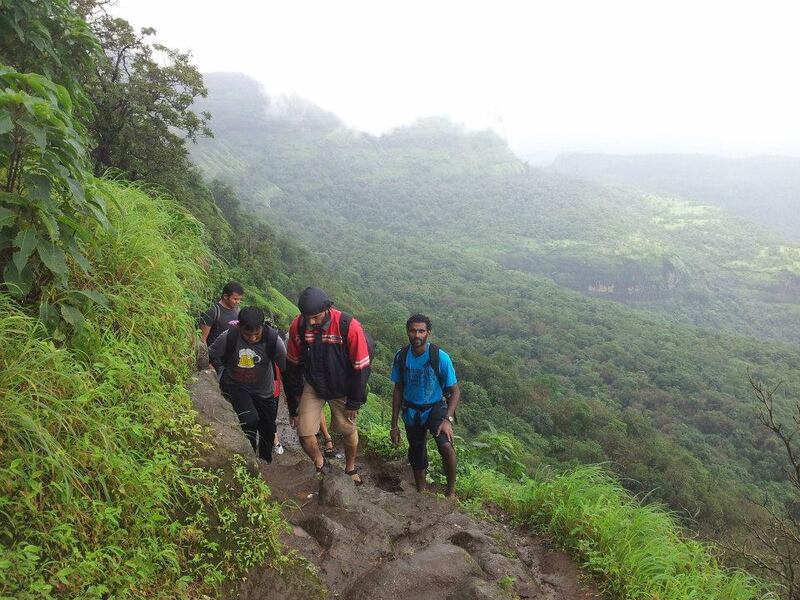 Go trekking at Bhimashankar. 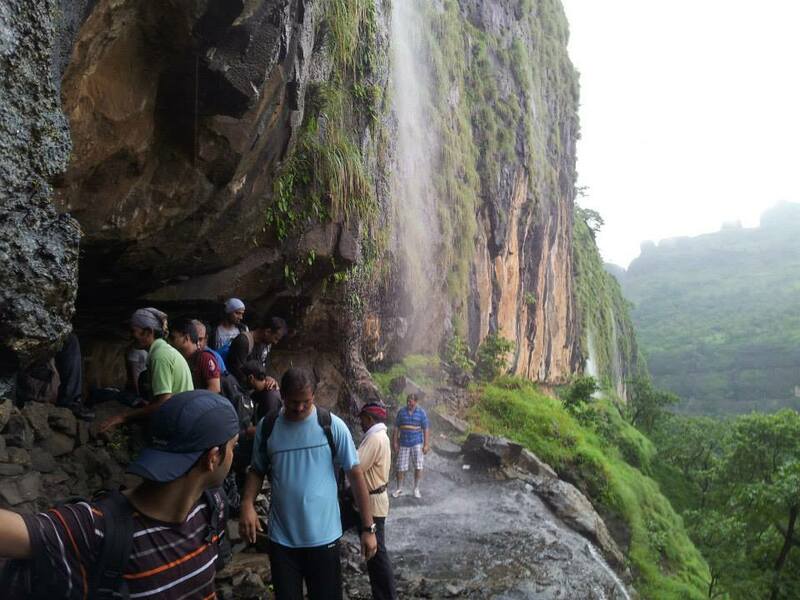 Trek through huge mountains, cross multiple waterfalls. Explore the plantations around. 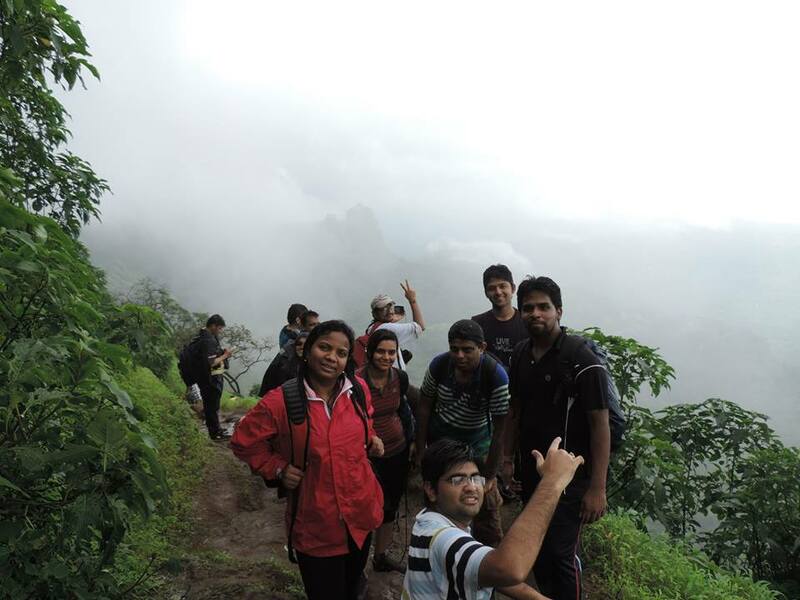 many hikers love to try Bhimashankar Trek for the adventure and mystical beauty it provides. A picturesque and breathtaking view for nature photographers. 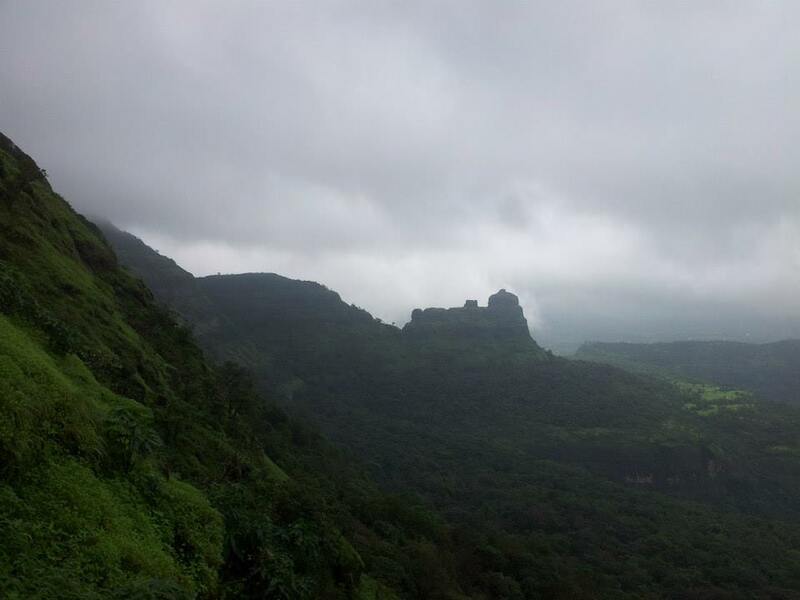 For the easy-going, Bhimashankar is about 275 km from Mumbai by road is a weekend getaway. For others like us Bhimashankar is at 3250 feet high and a 4.5 hour grueling trek from Khandas village it is a test of endurance for our muscles, joints and of perseverance for our minds. 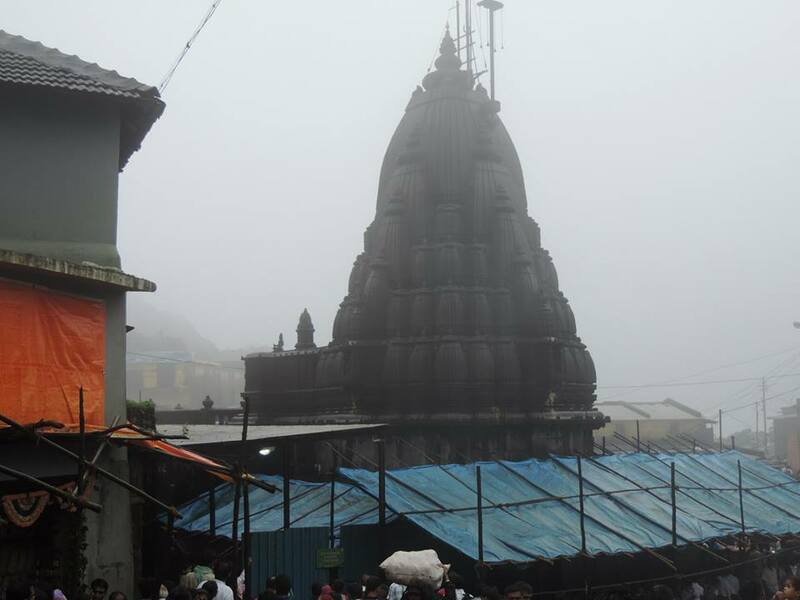 The temple on top dedicated to Lord Shiva dates back to 18th century. Legend is that Lord Shiva killed Bhima an Asura who lived there. 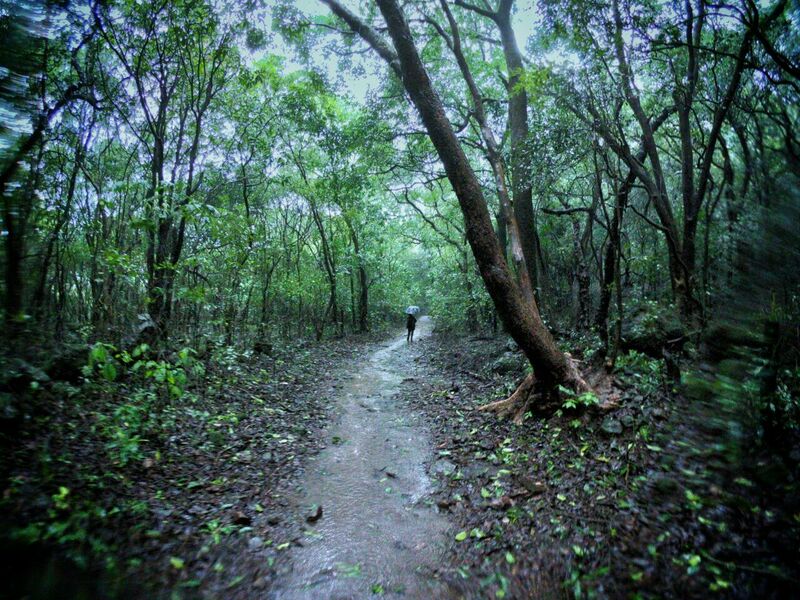 Bhimashankar wildlife sanctuary is home to a variety of endangered species of flora and fauna. The Giant Indian Squirrel is a major attraction while the other species present include Panther, Sambar, Wild Boar. 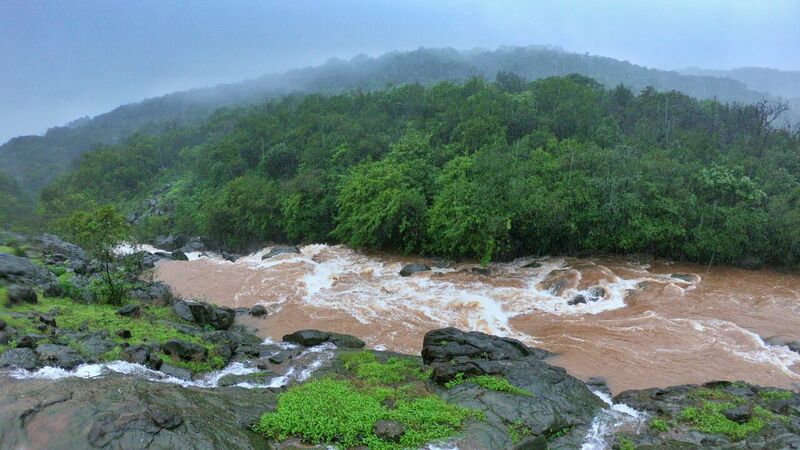 The Bhima river originates from here and joins river Krishna. 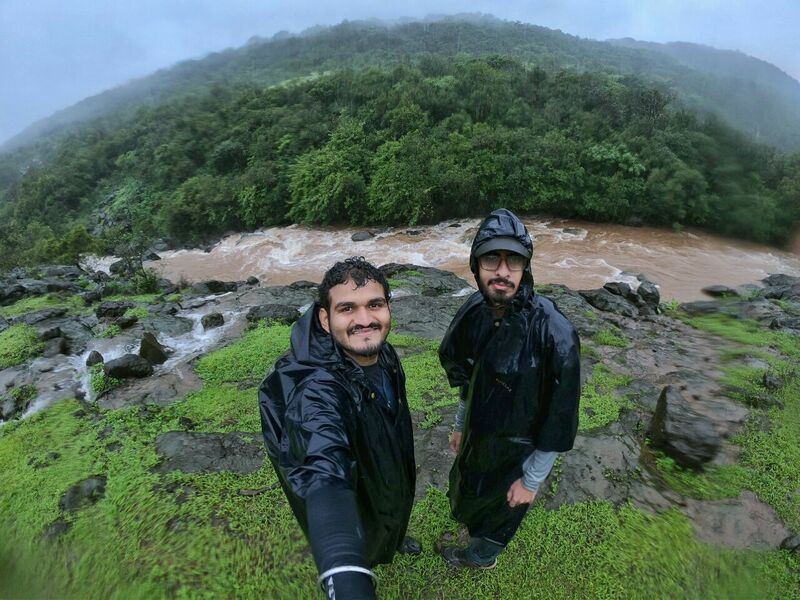 Trekking Bhimashankar during the monsoons is ideal and the most enjoyable, with endless stretches of greenery right from the base with waterfalls and gushing streams. But it is also risky. River Bhima also known as Chandrabhaga River especially at Pandharpur as it resembles the shape of the Moon. 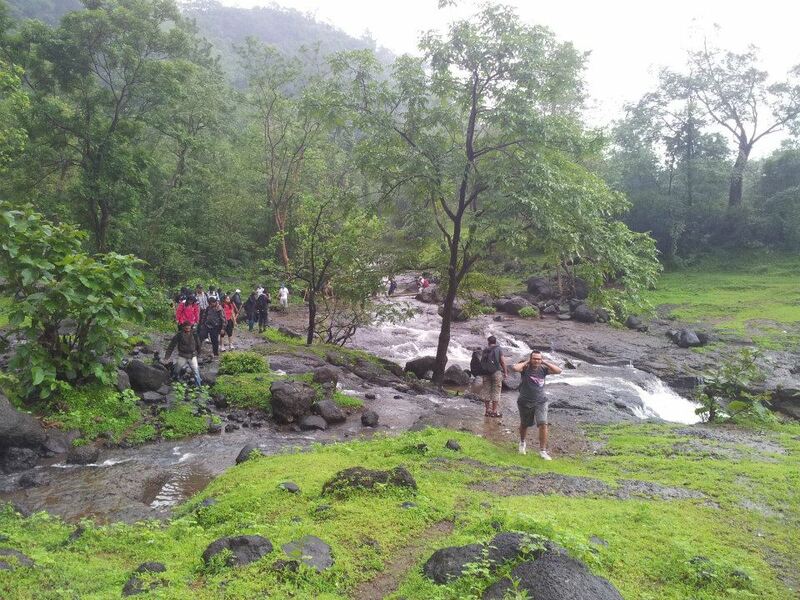 Trek to Bhimashankar was planned by Treks and Trails India I asked everyone to be on time & catch the last train leaving from CST Railway Station to Karjat Railway Station from their respective stations. Meeting point was 2nd last boogie of the train. Everybody was excited and caught the train through some of them caught the earlier train and some got into a different boogie. And as usual, few were following Indian Standard Time and missed the train. Everybody were scattered in the boogie as it was a crowded boogie till Kalyan but and many of us did not know each other. I was trying to talk with everyone so that they don’t feel left out. We reached Karjat and headed to the State Transport Bus stand were we rested for couple of hours. Early in the morning we got into 3 TUM-TUM bigger version of auto rickshaw and headed for Khandas the base village which was an hour ride. It was dark when we started our ride before dawn but later while traveling to Khandas, we had a real feeling of the countryside as we saw small villages, farms, animals, bullock cart which we don’t get to see in our day to day life. 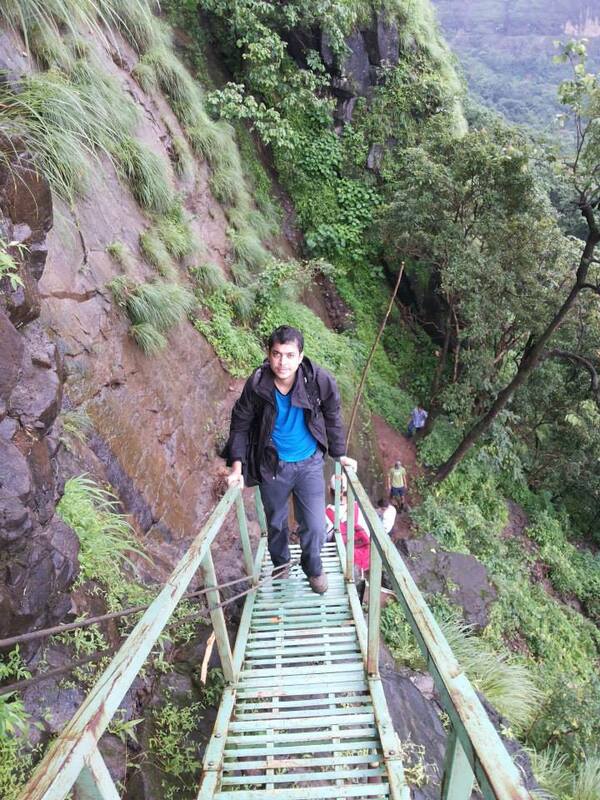 There are two Trek routes for Bhimashankar Ganesh Ghat and Shidi Ghat or Ladder route. We were going to ascend Via Shidi Ghat and descend Via Ganesh Ghat so that we can save time and enjoy the beauty of both the routes. We had hired a local villager who was going to help us while ascending till the Shidi Ghat were over. 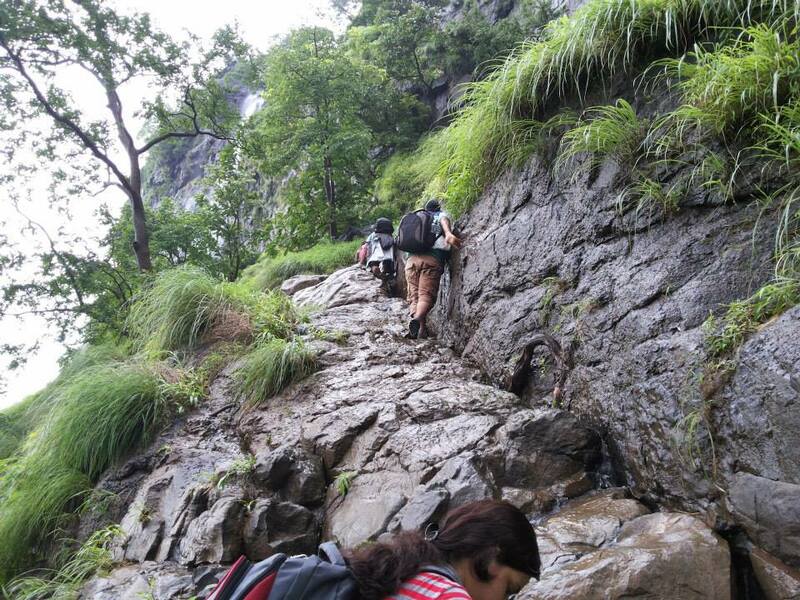 We briefed everyone about the trek, gave some instructions, dos and don’ts and then started the trek. Everyone was very excited and started the trek. Within an hour we reached the 1st ladder out of the 3 ladders were we meet 2 other groups who were climbing the ladder. The other groups were also big like us but were slow and didn’t have experienced people to assist them in the climb so I had to step forward as they had already slowed us down by an hour. We were running behind the schedule and our group had got divided into 2 due to other groups. We still managed to catch up with the 1st half of our group after crossing the 3 ladders as there is a plateau after the ladders where there are some huts who sell tea, buttermilk, lime juice, biscuits, bhakri. This is the place where both the routes meet and from here there is only one single route. From here the route ahead was steep but our 1st half group had waited for us over there for more than half an hour so they requested me to allow them to go ahead. 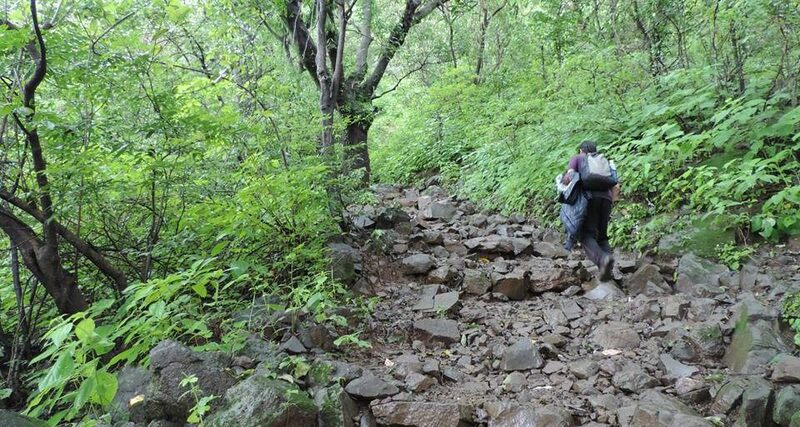 I was hesitant to allow them but they were bored so I gave them permission to go ahead, as it consisted some experienced trekkers who had done this trek before. I had instructed them to meet near the Bhimashankar temple and also give order for lunch as it was Shravan season there would be pilgrims in huge numbers visiting Bhimashankar and we had to save time. After 2 hours the 1st group called me and said they have reached the top and there is lot of crowd and a very long line for darshan due to Shravan Sunday. So they are thinking to skip the darshan and visit Gupt Mahadev or also known as Gupt Bhimashankar to which I agreed. Gupt Mahadev is around half an hour walk from the temple near a flowing river. They had also placed the order for lunch with a local resident over there. While climbing we got a very pleasant climate and not much of rain so we were able to get good view around of the natural beauty. And after few hours we finally reached the top. On the top there is a lake. It took approx. 2-1/2 hrs. to reach top. After reaching the top we went near the temple where we were supposed to meet but couldn’t find any network to contact the 1st group. So we had to wait there and while we were waiting near the temple we realised that some of our group trekkers are not with us and we had to search for them as cell phones were not reachable and the crowd was increasing. After looking for them around we found some of them and came to know via other trekkers that 4 of our trekkers had decided to quit and left by bus for Mumbai to which we were upset and disappointed. After lunch we started our journey back right away and we had to ensure that we reach down soon as it would become dark and very few of us had carried torch. So the instructions were given to the entire group clearly and we started descending down. While descending we were enjoying scenic beauty around us and also meeting many devotees climbing up for the next day darshan. 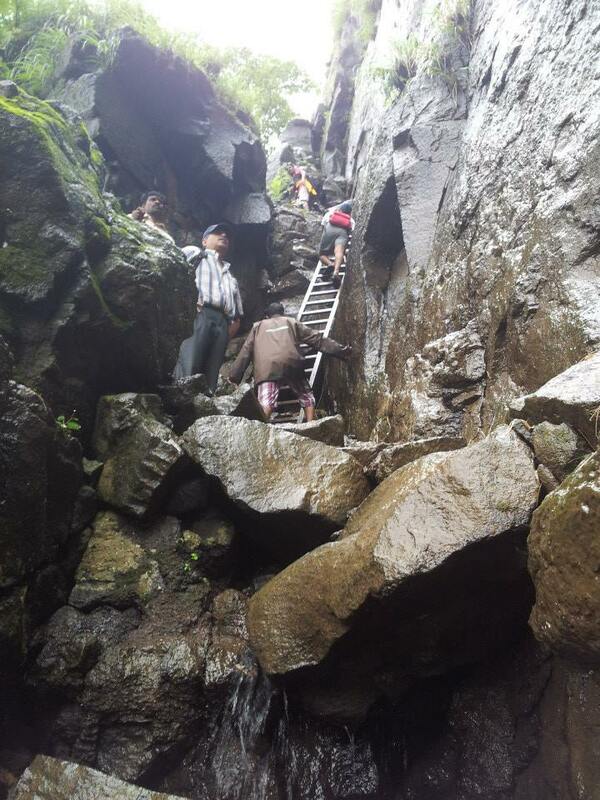 By god grace we did not have too many people slip and fall which normally happens in this trek during this season and all of them maintained a healthy speed too. One of our trekker was around 50 plus but was very sporty as we had taken only one short break and descended via Ganesh Ghat which is a long and easy route. We reached the Ganesh mandir and took the darshan and a small break and again started to descend. We all reached down with in time and there was still daylight. I had already called the Maruti vans when we reached the Ganesh mandir and informed them that we should be down in an hour’s time or so. He said that it will take some time as one of the vans was on his way from Karjat, so I decided to send the other 2 vans ahead so that they can reach home soon and I stayed back with some other trekker for the last van to come. Finally, after some time the last van came and we started our ride back to Karjat station. We reached Karjat station and a train for Mumbai just left which we were unable to catch, so now we had to wait for around 20-30 minutes for the next train. Then the next train came we got into it and were relaxing. By this time everyone’s energy was crushed but still we chatted and one by one everyone alighted at their respective stations as we had boarded. We wished a final goodbye of this wonderful journey to each other as this was one of the most memorable treks we had. Bhīmāshankar Temple is a Jyotirlinga shrine located 50 km northwest of Khed alias Rajguru Nagar, near Pune, in India. 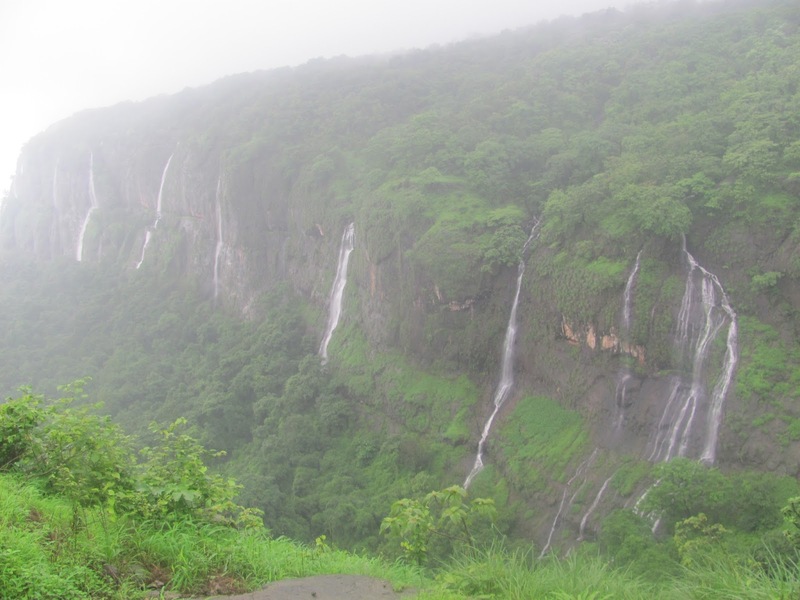 It is located 127 km from Shivaji Nagar in Pune in the Ghat region of the Sahyadri hills. Bhīmāshankar is also the source of the river Bhima, which flows southeast and merges with the Krishna river near Raichur. The other Jyotirlinga shrines in Maharashtra are Trimbakeshwar near Nashik and Grishneshwar near Aurangabad.